The Fairchild XNQ (T-31) (Model M-92) was an American trainer designed as a standard primary trainer for the U.S. Air Force during the 1950s. If the Fairchild XNQ had gone into production in its T-31 guise, it would have been the first United States Navy-designed airplane used as a standard primary trainer for the U.S. Air Force. Before 1947, the Navy had always used slightly modified versions of Air Force aircraft. Designed by Fairchild Aircraft as a replacement for current primary trainers, the XNQ-1 was the fastest primary trainer to date. The Model M-92 featured a controllable pitch propeller, flaps, electronically operated retractable landing gear and all-metal skin with fabric-covered rudder, ailerons and elevators. Its unobstructed, one-piece bubble canopy provided instructors and students seated in tandem with all-round visibility, and its cockpit instruments were arranged to match those found in a 600 mph jet fighter or a 5,000-mile, long-range patrol plane. To help students recognize the instruments, the landing gear handle was in the shape of a tiny landing gear wheel, and the flap handle was shaped like the airfoil of a flap. The XNQ-1 basic/advanced trainer was developed for the U.S. Navy and was first flown by Richard Henson on 7 October 1946. Two prototypes were flown as XNQ-1 [75725/75726]. Delivered to the U.S. Navy in 1947, after trials flown by Commander Robert M. Soule, they were rejected. Tests had revealed problems with exhaust fumes leaking back into the cockpit. The first prototype was subsequently to receive a number of engine upgrades, first powered with 320 hp Lycoming R-680-13, then finally with an inline 350 hp Lycoming GSO-580. The aircraft was destroyed in a crash in 1950. The second aircraft (BuNo. 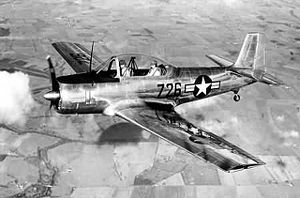 75726) with a larger stabilizer was evaluated by the USAF in 1949 as a replacement for the AT-6, being selected on 24 March 1949 as a primary trainer. Designed as an acrobatic airplane to teach pilots basic maneuvers, such as stalls, spins, rolls and dive pullouts, Fairchild received a contract for 100 aircraft as the model 129, USAF designation T-31. However, the order was cancelled later in 1949, in favor of the Beech T-34 Mentor. Fairchild dropped plans to develop the design as the company concentrated on other production contracts, including the Fairchild C-119. The second aircraft, privately owned, was still on the civil register on 15 January 2006.